Since his hiring as the Lions head coach, Jim Schwartz has been anything but reclusive. 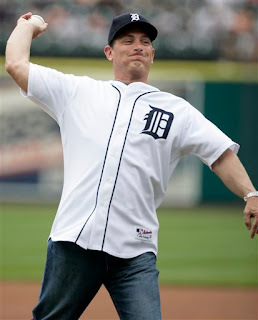 He appeared on the radio show "Mike in the Morning" on WRIF-FM (101.1) in early May, was a visible part of the Lions' own fundraising Tony Filippis Bocce Tournament weeks later, and just last Sunday thew out the first pitch in the series finale between the Angels and Tigers at Comerica Park. His next appearance? How about waving the green flag Sunday at Michigan International Speedway as the honorary starter for the NASCAR Sprint Cup Series race, the LifeLock 400. It's a perfect time for Schwartz to spend getting to know the rest of the sports world in Michigan, since the Lions are between their recent organized team activities (OTAs) and a mandatory minicamp scheduled for the last week in June.